Learn about the details available for the discounts you want to offer! First, choose the Discount Type: a dollar value, a percentage discount, or free shipping. NOTE: If you want the discount to require a minimum purchase value, check the “This discount requires a minimum purchase” checkbox. Enter a value in the field that appears. Next, set specifically what this discount will apply to using the "Applies to" section. The discount can be applied to: Entire order, Selected collections, or Selected products. If Selected collections or Selected products is chosen, then add in the specific collection(s) or product(s) that this discount can be used for. When you select the "Fixed amount" discount type and select collections or products, the “This discount will apply only once per order” checkbox will also show. Check this checkbox if you want the discount applied only once per order. Uncheck the checkbox if you want the discount to apply to each eligible product in the order. This setting is checked by default. Next, set the "Customer eligibility". This section allows you to specify which customer group(s) this discount will be eligible to: Everyone or Selected groups. Customer eligibility specifies who the discount is "eligible" for, not who will see the popup. The popup will show to any visitor who meets the conditions of the Trigger, regardless of what you set for "customer eligibility". For that reason, we recommend to make a note of this on the popup directly. 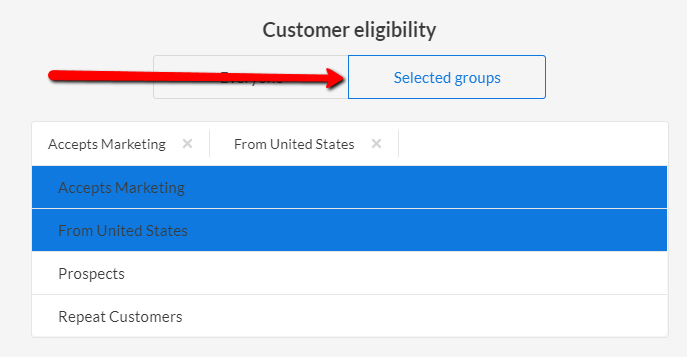 For example: "Only eligible for x,y,z customers etc.."
If Selected groups is chosen, then select the desired group(s) from the available groups. Countries - this discount will be available to customers from All countries or from Selected countries. Be ready to select the needed country(s) when the Selected countries option is chosen. If you want to exclude the discount from being applied to an order with shipping rates over a certain amount, check the “Exclude shipping rates over a certain amount”checkbox. Enter a monetary value in the field that appears.